When I think of “Back to the Table”, our Recipe Redux theme for this month, my memories take me back to our family dinner table where the six of us sat dutifully and ate a meat, a vegetable and a starch. We each had our own assigned seat and our own assigned duty, depending on the day. One of us set the table, one cleared, one put away condiment and leftovers and the other person was responsible for the dishes. To this day, my favorite thing is to put away condiments and the leftovers. Mom would occasionally lug out an old cookbook-particularly around the holidays-and she seem to aways be tearing out recipes from magazines and the newspaper. In an effort to create her own filing system (Pinterest of the 70’s) , she stapled the torn out recipes to color coded index cards. Much like Pinners today, she had very high hopes of making said recipes, but rarely-if ever-did. Flash forward 35 (gulp) years. My family make up is quite different than it was back in the day. We’re smaller (3 humans, 3 dogs and a turtle), we utilize prepared foods frequently (rotisseire chickens, salad bar offerings, pre made rice) and we eat out more often than I did as a child (remember when eating out was for special occasions only?) How do I make those three that work to our advantage? It’s-well-almost embarrassing. 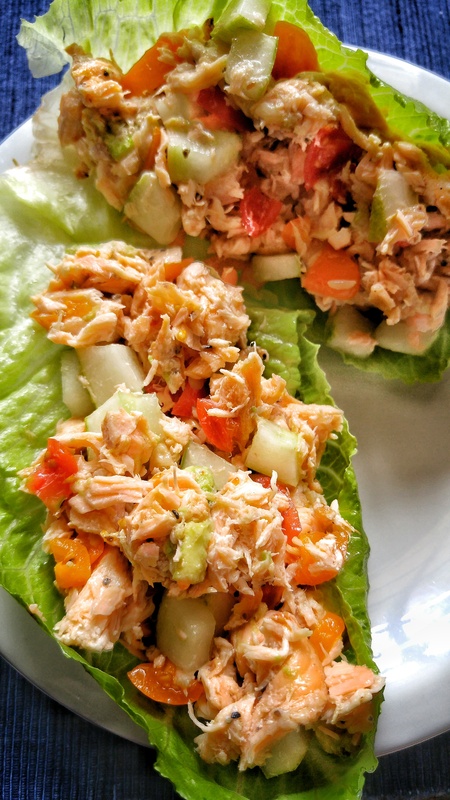 Take this salmon salad, for example. This was made from salmon purchased from my local grocery store salad bar. I added chopped tomatoes, cucumbers and avocado and called. it. a. day. 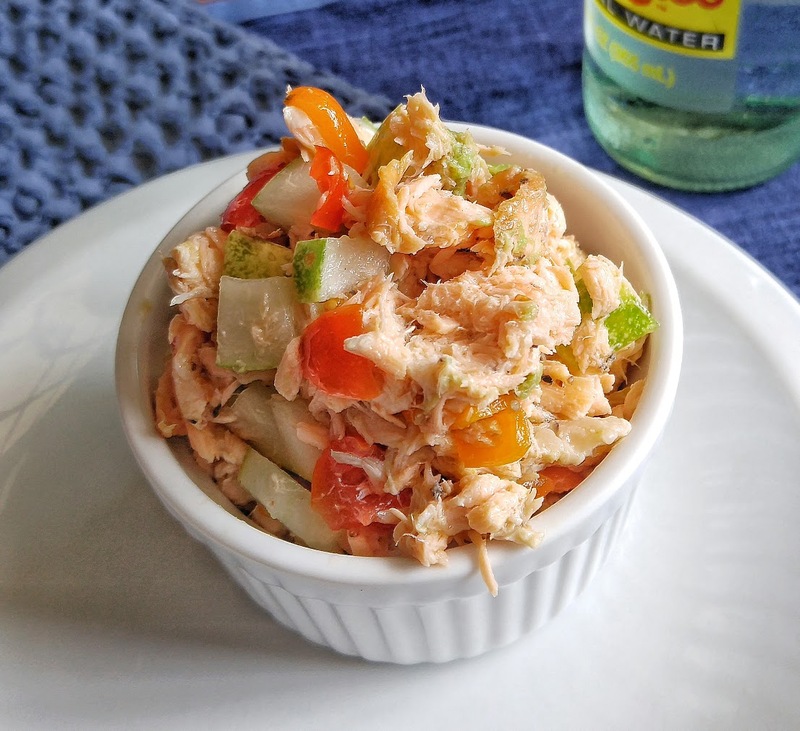 If you don’t have cooked salmon on your local grocery salad bar, leftover salmon from a previous home cooked meal OR restaurant meal works just as good. No tomatoes, cucs or avocado at home? Snag them from the salad bar or ask for extras on from a sandwich bar. Any preparation and any flavor of salmon work. Baked, grilled, citrus flavored, Asian inspired or just good old salt and pepper–which is what you see in these pictures-it all works. The recipe, you ask? It’s so simple, it’s almost embarrassing, too. In fact, I think I already typed it above. Here it is again. The best part? It’s simple, filling, healthy and a crowd pleaser for most of the family. The other best part? Mom would have LOVED it. Couldn’t be easier or more nutritious! 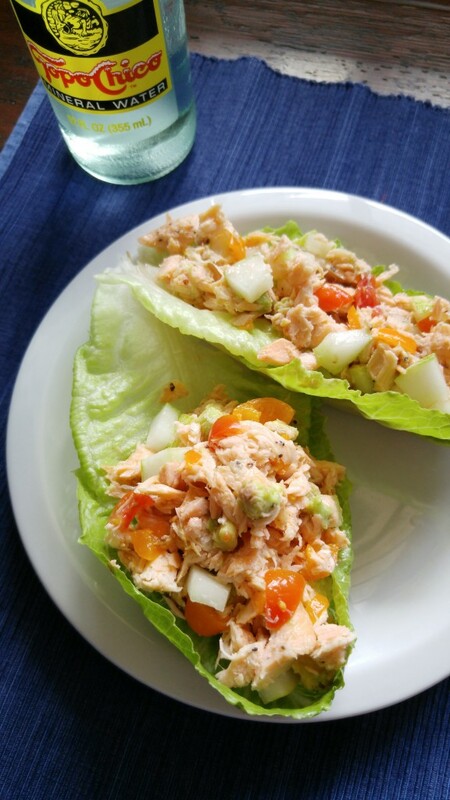 Buy cooked salmon from salad bar – now that’s a tip I’m going to use! I use the salad bar all the time for small amounts of items in recipes–that way I don’t wind up wasting or throwing stuff away! This is my kind of dinner! I love salmon salad, and yours looks so delicious. I love salmon salad. Sounds like a perfect lunch to me! Lunch, dinner or even breakfast–it’s great on a bagel or in eggs! I love the simplicity of the ingredients and the ways you listed to make it easier to get all the ingredients. I should definitely take advantage of the salad bar more! Looks like a flavorful recipe! i make salmon every other week or so, next time will definitely be trying this. So easy, I have to make it! Love that it’s from the store salad bar. Great tip! Sometimes you just want an uncomplicated recipe! Healthy food on the table without much effort- sounds yummy!